A few of the most tedious men in the auto industry are dropping the science behind the launch of the Skoda Octavia in the world's second largest auto industry. According to the Shanghai Volkswagen heads, the Chinese Octavia is more advanced than the European model. Plus, it's apparently available with the "Turbochanger Superchanger Injection" motor. Which — as far as we can make out is a breakdancing transformable robot that leaps out of the engine bay and pulls you to safety when the going gets seemingly impassable. Skoda for life! 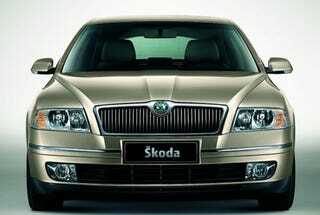 Skoda for victory!